The APEC 2019 conference held last month in Anaheim drew a record 6200+ attendees to discuss a broad array of issues in power electronics. That so many participated is testament to the hard work that has gone into building this event over the years and to the vibrancy of the industry. For several years now, wide-bandgap semiconductors have had a high profile at the conference and each year there are more signs that SiC and GaN power devices are entering the mainstream. The startup era seems to be ending in that now all of the mainline silicon power semiconductor manufacturers either have SiC and/or GaN in their portfolios or have indicated plans to add them. Nevertheless, while the wide-bandgap discussions and developments still grab attention, the tide of power semiconductor innovations may be shifting back to the IC realm where both startups and established companies are developing new power topologies, architectures and circuit solutions. Many of the new devices continue the practice of modifying the familiar flyback and buck converters, and even linear regulators, but do so by combining them with charge pumps and other elements. Innovation in controller design can take some unexpected turns such as one startup’s use of artificial intelligence to enable soft switching of inverters. Among the new devices, some approaches eschew elegant circuit design in favor of extreme but seemingly manageable complexity. Some leverage their abilities to pack more silicon and passives into tiny molded packages, demonstrating the importance of packaging design. You can read about some of these developments in this month’s Power Products news and observe other IC-level innovations in this month’s design articles. This issue also brings further discussion of magnetics design, safety & compliance and more. here includes six operating modes. by Farhana Sarder, ON Semiconductor, Phoenix, Ariz.
by Reno Rossetti and Tom Bui, Maxim Integrated, San Jose, Calif.
resulting in very low leakage current. Photo: This point-of-load converter produces a programmable output of 0.7 V to 1.8 V at up to 6 A in a package measuring 12 mm x 9 mm x 2 mm. This footprint is said to be 25% less than that of the nearest competitor. Diagram: The converter uses a two-stage architecture that combines a “pipeline” stage switched-capacitor network (charge pump) with a buck stage. 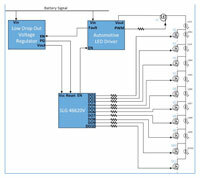 Photo: Using a charge pump to stepdown the 12-V input to 4 V, allows use of low-voltage MOSFETs in the buck, which improves efficiency while also supporting the use of higher switching frequencies. Photo: Pre-Switch uses artificial intelligence to adjust switch timing and achieve ZVS/ZCS operation in an inverter across variations in input voltage, input and output current, device and temperature variations, and topology or switch type. Diagram: Adaptive soft-switching topology is implemented using a controller IC in combination with resonant power and gate drive circuitry. In the case of Pre-Drive3, the company packages this technology as a three-phase controller board in which the resonant power and gate driver circuitry is optimized for the particular power switch being used in the application. 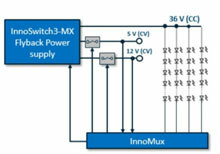 Diagram: InnoSwitch3-MX and InnoMux ICs power supply architecture. This 91%-efficient single-stage architecture provides independently regulated multiple CV and CC outputs, eliminating the post regulators used in conventional two-stage designs. Diagram: The InnoMux chipset monitors all outputs and steers energy only to the output requiring energy. Table: The addition of 10 new automotive-grade SiC MOSFETs in the SCT3xxxxxHR series enables the company to offer what’s described as the industry's largest lineup of AEC-Q101 qualified SiC MOSFETs that provide the high reliability necessary for automotive on-board chargers and dc-dc converters. Diagram: These automotive-grade SiC MOSFETs are manufactured in a vertically integrated production system, which enables high levels of quality control and device reliability. More Power Products. . .
Richardson RFPD has announced the launch of the GaN & SiC for Power Electronics Tech Hub, a microsite featuring the latest news on gallium nitride and silicon carbide innovations and product releases. The Power Sources Manufacturers Association (PSMA) has announced the 2019 edition of the Power Technology Roadmap. The report, which forecasts the power technology and power delivery trends through 2023, adds a new section surveying global academic research activities. 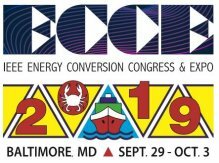 For those looking to exhibit at the upcoming IEEE Energy Conversion Congress & Expo in Baltimore, the prospectus for ECCE 2019 is now ready for viewing and download. Here it is. UnitedSiC, a manufacturer of SiC power semiconductors, has announced a strategic investment and long-term supply agreement from Analog Devices. At the upcoming PCIM Europe conference, Yole will host a market briefing on the “Impact of EV/HEV on the Power Electronics industry”. Dialog Semiconductor has announced the completion of its transaction for the license of certain power management ICs and the transfer of certain assets to Apple. ABOUT THIS NEWSLETTER: Thank you for reading HOW2POWER TODAY.